A bench made of stone. A bench is a kind of chair, a place where people can sit. Benches are long and often found outside, and more than one person can sit on them. 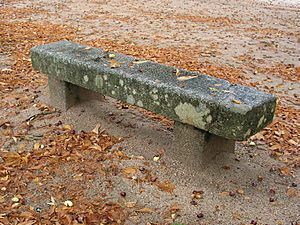 Benches are usually made of wood, metal, stone, and other synthetic things. Many benches have no back. Bench Facts for Kids. Kiddle Encyclopedia.